You and your business need content. Not just words and explanations but clear, useful, compelling and persuasive content that powerfully separates you from the competition and the clutter. Now that we’re closing in on the busy fall period, how do you find a great writer who can consistently provide the goods? It’s important to know the specific skills that will generate a productive and profitable client-writer relationship. Here are my thoughts on those skills that can help you move your business forward with great communications. 1. Creating a strong voice. Beyond using writerly techniques, an independent writer must be able to develop a strong, confident voice that reflects the personality and culture of your business. A good “pen for hire” must be flexible, a bit of a chameleon who can adjust by capturing in words the best of the client’s or brand’s personality. This ability takes time to develop but is rooted not only in creativity and talent but also emotional intelligence – the sensitivity and compassion to understand what motivates people. Not all writers have this combination of skills. But you’ll know it if the writer’s samples are a pleasure to read. — a keen understanding of spelling, grammar, and usage. Most businesses don’t want to hire an editor or proofreader, in addition to a writer. So your content pro must be able to protect you with an excellent understanding of proper usage and spelling. Clearly, if your content contains mistakes, you run the risk of looking foolish and unprofessional. While you may sometimes get tripped up about whether to use “it’s” or “its,” or “your” or “you’re,” your writer must know the difference cold. 3. Finding the compelling hook. Good writers start with well-crafted content. That’s just the price of admission. But if you don’t have a distinctive point of view or an interesting insight, you’re just reporting blah blah blah, and it may not get read or shared, at all. The best writers think about the topic a lot – sometimes in the middle of the night – looking for the hook that will grab the attention of, intrigue and even inspire readers. 4. Understanding elements that sell. It’s one thing to write a decent sentence or paragraph. But it’s another thing to move your audience from curiosity to interest to action – whether you’re selling a product, an idea or a social movement. The good writer understands how to use tools of the trade, like effective headlines or compelling bullet points, and what content works best in a blog, an email message or a white paper, based on a clear communications strategy. 5. Explaining how and why it works. A good writer will be able to tell you why he or she has taken a particular angle, why communicating about benefits are more important than features, and how to shape a call to action. He or she should be able to explain how and why these tools and techniques create content that gets noticed and drives business. 6. Being a continuous learner. If you’re looking for a writer, you want a pro. Otherwise, why bother? Pros are committed to learning – to refining their skills, becoming smarter about the world, and staying on top of communication trends. Writers who take their profession seriously and take the initiative to become an authority on the topic they’re writing about. 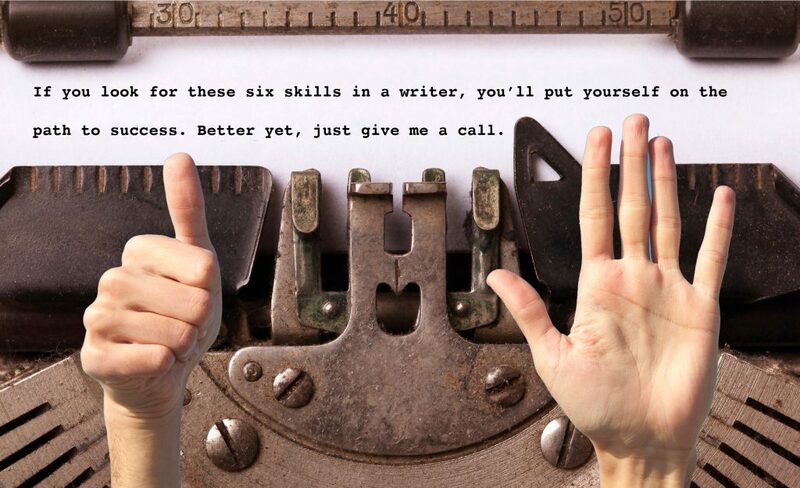 If you look for these six skills in a writer, you’ll put yourself on the path to success. Better yet, just give me a call.